The Parable of the Two Sons is actually one of three parables in Matthew 21-22 that are addressed directly to the Jewish leaders who refused to believe in Jesus. We will examine the others – the Parable of the Wicked Vinedressers and the Parable of the Wedding Feast – over the next two weeks. Introduction: As we have seen in our previous study of a number of Jesus' parables, it is crucial to understand the context in which each individual parable is told as well as any explanation Jesus may give. Well, today's parable is no different, and this is why – once again – I will discuss the parable under three headings: 1) the context of the parable, 2) the communication of the parable, and 3) the explanation of the parable. We find the context of the parable in verses 23-27. NKJ Matthew 9:1-7 So He got into a boat, crossed over, and came to His own city. 2 Then behold, they brought to Him a paralytic lying on a bed. When Jesus saw their faith, He said to the paralytic, “Son, be of good cheer; your sins are forgiven you.” 3 And at once some of the scribes said within themselves, “This Man blasphemes!” 4 But Jesus, knowing their thoughts, said, “Why do you think evil in your hearts? 5 For which is easier, to say, 'Your sins are forgiven you,' or to say, 'Arise and walk'? 6 But that you may know that the Son of Man has power on earth to forgive sins” -- then He said to the paralytic, “Arise, take up your bed, and go to your house.” 7 And he arose and departed to his house. On the other hand, if Jesus said that He got his authority from men, He would not only deny that He was a true prophet, but He would also bring the charge that He really had no authority at all. For they were considered the religious authorities in Israel, and they had clearly not authorized His teaching or actions! Jesus taught as one having authority, but they resisted His authority and were trying to undermine it. Jesus had said He would tell them by what authority He did the things that He did, but only if they first answered His question about John the Baptist. Since they didn't want to give Him a straight answer to His question, He followed through on what He said and gave them no answer to their question. Yet He doesn't simply drop the matter. Instead, He tells a short parable and continues to question them in order to highlight the real issue, namely their unbelief. We find Jesus' communication of the parable beginning in verse 28 and extending through the first part of verse 31. 2) It can mean “to change one’s mind about [something], without focus on regret, change one’s mind, have second thoughts” (BAGD3 #4851, BibleWorks). Either way the basic idea is one of repentance, as we shall see more fully below. This is why I prefer the first translation, regret, which is followed by the NKJV and the NASB. At any rate, the point Jesus is seeking to make is pretty hard to miss, even for these spiritually obtuse Jewish leaders. The first son initially refused to obey but then regretted his decision and obeyed, while the second son at first appeared to obey but never actually followed through. The issue is genuine obedience that follows a change of heart verses pretended obedience. Thus, without further ado, we may proceed to Jesus' explanation. The explanation of the parable is found beginning in the second part of verse 31 and extending through verse 32. NKJ Matthew 21:31b-32 Jesus said to them, “Assuredly, I say to you that tax collectors and harlots enter the kingdom of God before you. 32 For John came to you in the way of righteousness, and you did not believe [πιστεύω] him; but tax collectors and harlots believed [πιστεύω] him; and when you saw it, you did not afterward relent [μεταμέλομαι] and believe [πιστεύω] him. There are at least three points that need to be considered here. First, when Jesus tells the Jewish leaders that “the tax collectors and harlots enter the kingdom before you,” it is somewhat difficult to understand what this means. At first glance He seems to be saying that these Jewish leaders who haven't believed will indeed enter the kingdom, but only after the the tax collectors and harlots who have believed. But this makes no sense at all in the context, and it also denies the teaching of Jesus and His Apostles elsewhere, which makes it clear that those who do not believe cannot enter the kingdom. This is one reason that D.A. Carson and a number of other noted scholars think that the Greek verb in the last part of verse 31 should not be translated as go before, but rather as go instead of. Oh! beware of saying as some of you do, “I go, sir,” while you go not. I sometimes see sick people who quite alarm and distress me. I say to them, “My dear friend, you are dying; have you a hope?” There is no answer. “Do you know your lost state?” “Yes, sir.” “Christ died for sinners.” “Yes, sir.” “Faith gives us of his grace.” “Yes, sir.” They say, “Yes, sir; yes, sir; yes, sir; yes, sir; yes, sir.” I sometimes wish before God they would contradict me, for if they would but have honesty enough to say, “I do not believe a word of it,” I should know how to deal with them. Stubborn oaks are leveled by the gale, but those who bend like the willow before every wind, what wind shall break them? O dear brethren, beware of being gospel hardened; or, what is the same thing, softened but for a season. Beware of being a promising hearer of the word, and nothing more! Perhaps there are some here even this morning who fit Spurgeon's description, who know they have been saying all the right things, but who also know that that they haven't truly believed. If so, I implore you not to put off trusting in Christ any longer. It is time to get real with God! Third, Jesus also presses home the reason He had previously asked the Jewish leaders about their opinion of John. In the process, he reminds them that they have really already had two opportunities to relent and believe, although they had taken advantage of neither of them. They had been like the second son in the parable, when they should have been like the first. Even though they had not responded rightly to John's message in the beginning, they should have regretted it and believed afterward. Although earlier Matthew had referred to the Jewish leaders in terms of their religious positions – as Pharisees and Sadducees – in the passage before us this morning he identifies them instead by their religious titles or status – as the chief priests and elders of the people. But they were essentially the same groups and thus they are challenged for having committed the same sin, namely that they had professed to be true followers of God and thus workers in His vineyard (in the language of the parable), but they were all talk and no action! They said they would obey God, but when challenged both by John and by Jesus to do so, they refused! 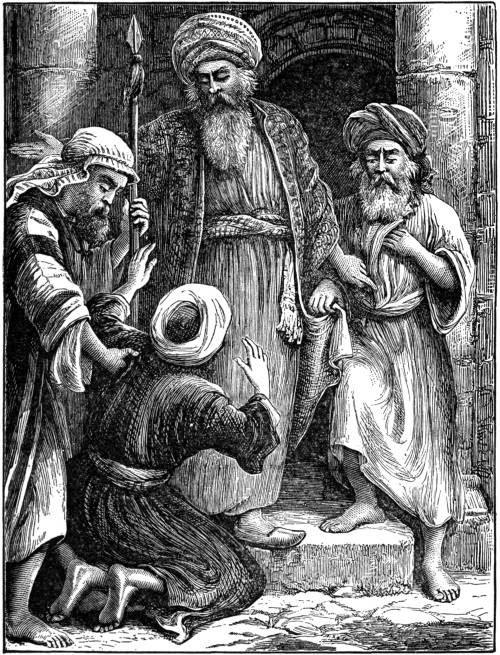 And if this weren't bad enough, they had not only the witness of John the Baptist and Jesus, but – as Jesus Himself points out – they had the witness of the radically changed lives of many tax collectors and harlots to demonstrate to them the reality and power of the kingdom message that they had been preaching. But they still did not repent and believe! Jesus said that they should have, and this parable challenges them to do so once again. Conclusion: I would like to close by posing a few questions that we can each ask ourselves. For example, you might want to ask yourself, “Do I profess to believe in Jesus, although I know I have not really repented of my sin?” Or, perhaps you could ask yourself, “Do I claim to have repented of my sin, yet do not follow the Lord in obedience?” If you have not genuinely repented and obeyed the Gospel, then I pray by God's grace that you too may regret this and trust in Him today. Would it not be nice if it really were a sin to pay taxes? 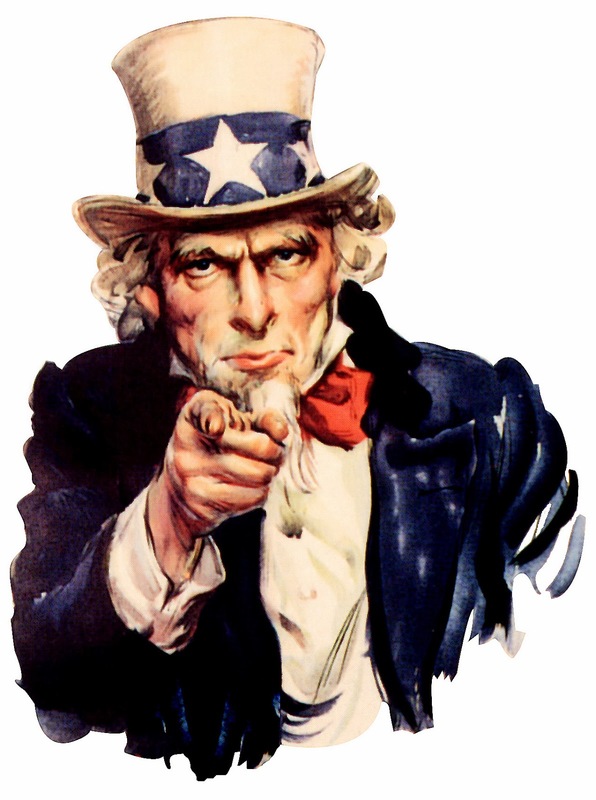 I get discouraged, very discouraged, when I think that a third of my paycheck goes to Uncle Sam. Nevertheless, the Bible says something along the lines as, “render to Uncle Sam what is Uncle Sam’s.” So paying taxes, sadly, is not a sin but a divine mandate. Yet, when the Lord tells us, “Render therefore unto Caesar the things which are Caesar's; and unto God the things that are God's” (Matt. 22:21), we are not only given instructions on paying taxes, but more importantly, we are given a helpful key in understanding our relationship with the culture and secular governments. 1. What is the Christian's responsibility to secular governmental powers? The main point to take away is that scholars are not seriously considering the traditional site as the right one at all. Shanks himself "proposes that we reexamine ... the 'Midianite Hypothesis.' According to this theory, Mt. 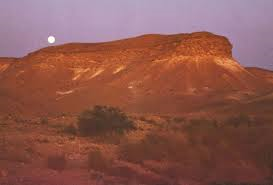 Sinai was not in the Sinai Peninsula, but in Midian in northwest Saudi Arabia." At any rate, I thought the blog's readers might be interested in a current trend among Biblical archaeologists concerning the matter. Scripture Reading: It is important to read all of Matthew 19:16-20:16 in order to get the whole context in our minds. 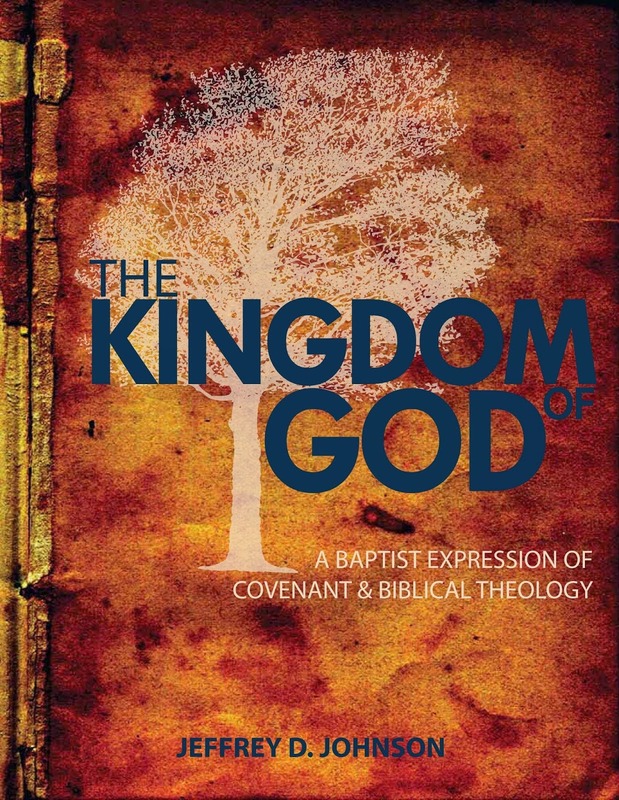 This will be important to our understanding of Jesus' teaching in the parable. Read 19:16-22 – The rich young man refused to give up his wealth to follow Jesus, which means that he was not keeping all the commandments as he had claimed. In particular, he was not keeping God's command that “you shall have no other gods before Me” (Exod. 20:3). His wealth was an idol that kept him from following the One he had just recognized as “good,” and thus worthy of following. First, Peter's question (vs. 27) is not about salvation. It is about the rewards to be expected by those who have – unlike the rich young man – given up all to follow Jesus. In both cases, that of the agreed amount of a denarius and that of the agreed amount that is considered right by the landowner, the workers accepted the landowner's offer. First, notice that the order in which the workers are paid is reversed from the order in which they were hired. They are paid beginning with the last to the first (vs. 8). This reflects Jesus' earlier statement that “many who are first will be last, and the last first” (19:30). Thus Jesus is clearly identifying the theme He wants to emphasize. Second, notice that the workers are all paid the same wage – a denarius – even those who were hired at the eleventh hour (vs. 9). This represents mercy and generosity on the part of the landowner, who wanted to make sure that everyone had enough to live on that day, even if they hadn't been able to work the whole day. It would be hard to imagine that those hired so late in the day wouldn't have been quite surprised at such generosity! Those hired earlier are actually accusing the landowner of having been unfair because in their minds he had treated those who were hired later as though they had worked all day when, in fact, they had worked but one hour. These men are much like little children who think that fairness means treating everyone the same way. But this isn't true, and it definitely precludes treating some – who may be in a more desperate situation – with true generosity. Second, the statement that “many are called, but few chosen” is not included in a number of modern translations because it is not found in a handful of old manuscripts. But I think it is also left out because it is hard for so many to figure out how it fits the context, which plainly has Jesus answering Peter's question in 19:27 about the rewards believers may expect from the Lord. Thus, a reference to many being called, but few being chosen just doesn't seem to fit, since it apparently speaks of some who are not believers at all. But, once again, I think that a close examination of the context may relieve the difficulty. Recall that what led to Peter's question in the first place was Jesus' reflection on the situation of the rich young man. 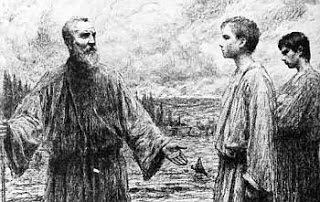 And remember that Jesus' reference to the landowner as good [ἀγαθός] shows that he still had the conversation with this young man in mind as well. This leads me to the conclusion that, whereas all those who will receive rewards – be they first or last – are chosen, it is only the chosen who will receive such rewards. But there are many– such as the rich young man – who are not chosen, and they can expect no rewards at all. Conclusion: What about you? I presume all of you are here today because you have heard some kind of Gospel call. But are you one of the chosen? Or are you like the rich young man, trusting in your own ability to be pleasing enough to God for Him to save you, which can never happen?! Or is there an idol in your life that you refuse to give up in order to truly follow Christ? If so, I pray that by God's grace you will reject the idolatry that we are all so prone to, and that you will trust in Christ alone to save you. This is where the debate was most important. Both men were asked if any evidence could ever force them to change their basic understanding. Both men said no. Neither was willing to allow for any dispositive evidence to change their minds. Both operate in basically closed intellectual systems. The main problem is that Ken Ham knows this to be the case, but Bill Nye apparently does not. Ham was consistently bold in citing his confidence in God, in the gospel of Jesus Christ, and in the full authority and divine inspiration of the Bible. He never pulled a punch or hid behind an argument. Nye seems to believe that he is genuinely open to any and all new information, but it is clear that his ultimate intellectual authority is the prevailing scientific consensus. More than once he asserted a virtually unblemished confidence in the ability of modern science to correct itself. He steadfastly refused to admit that any intellectual presuppositions color his own judgment. But the single most defining moments in the debate came as Bill Nye repeatedly cited the “reasonable man” argument in his presentation and responses. He cited Adolphe Quetelet’s famed l’homme moyen—“a reasonable man”—as the measure of his intellectual authority. Writing in 1835, Quetelet, a French intellectual, made his “reasonable man” famous. The “reasonable man” is a man of intellect and education and knowledge who can judge evidence and arguments and function as an intellectual authority on his own two feet. The “reasonable man” is a truly modern man. Very quickly, jurists seized on the “reasonable man” to define the law and lawyers used him to make arguments before juries. A “reasonable man” would interpret the evidence and make a reasoned judgment, free from intellectual pressure. Bill Nye is definitely still a believer in the myth of neutrality, and nothing or no one was going to challenge that myth. If you are interested in hearing more from Ken Ham about how the debate went, tonight you can watch Ken Ham and Georgia Purdom discuss the debate at 8:00 PM (ET). 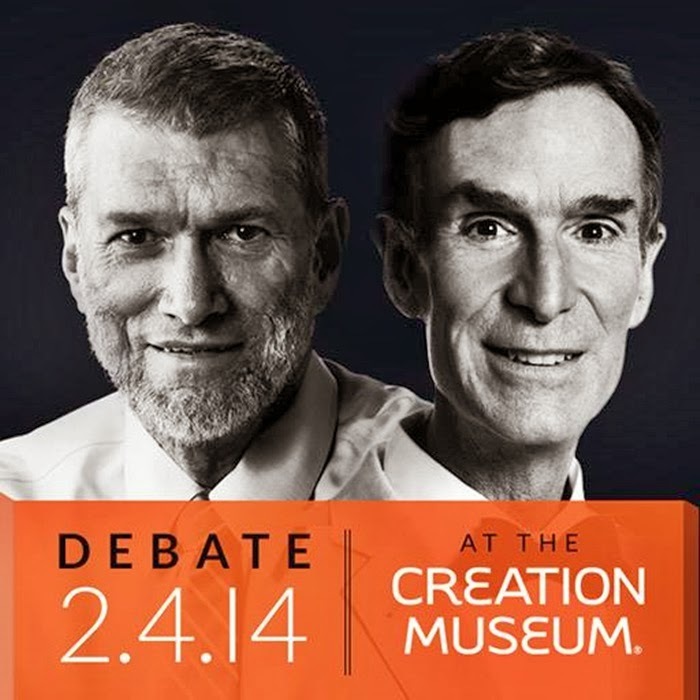 Here is a post-debate interview by Piers Morgan of Ken Ham and Bill Nye. Sadly, he focuses the whole discussion on "global warming." Gary DeMar also weighs in with an article entitled Where the Bill Nye v. Ken Ham Debate Went Off Track. As always, we welcome input from the blog's readers. If somebody killed your child, could you ever forgive him? By God's grace the raging desire for revenge might eventually die down within our hearts, but most of us would probably prefer never to see that person again nor to help him in any way. Yet that was not the reaction of Walter Everett, a Methodist pastor in Hartford, Connecticut. When Michael Carlucci was convicted of manslaughter for shooting Everett's son, the bereaved father set an example that challenges all of us who claim Christ as Savior. Now, we may not always see our willingness to forgive someone lead to his salvation, but we should all certainly obey Paul's command that we “be kind to one another, tenderhearted, forgiving one another, even as God in Christ forgave you” (Eph. 4:32). In fact, that is the essential point of the parable before us today. In our examination of this parable, we will look at 1) the context of the parable, 2) the communication of the parable, and 3) the explanation of the parable. Peter knew by this time that Jesus would expect a righteousness from His disciples that exceeds that of the scribes and Pharisees (Matt. 5:20), but he hadn't yet understood by just how much, as Jesus' answer will show. NKJ Genesis 4:24 If Cain shall be avenged sevenfold, then Lamech seventy-sevenfold [LXX = ἑβδομηκοντάκις ἑπτά]. The LXX translates the Hebrew reference to seventy plus seven with a Greek phrase that may also mean seventy times seven. Thus the ESV and NIV translate the phrase as “seventy-seven” – preserving the allusion to Genesis 4:24 in the English text – whereas the NKJV and NASB adopt “seventy times seven” as the preferred translation. But whichever translation one adopts, the point that should not be missed is that it is this precise phrase that is used by Jesus here in Matthew 18. Thus, He is indicating that we should be as zealous in forgiving others as the infamous Lamech was in seeking vengeance. Jesus is certainly not indicating that we should keep a strict count and forgive a brother only up to 490 times! Rather He is choosing a much bigger symbolic number than Peter has chosen in order to show how limitless our willingness to forgive should be. That this understanding is correct becomes even more apparent in the following parable. The parable has three scenes, and we will briefly consider each of them. NKJ Matthew 18:23-25 23 Therefore the kingdom of heaven is like a certain king who wanted to settle accounts with his servants. 24 And when he had begun to settle accounts, one was brought to him who owed him ten thousand talents. 25 But as he was not able to pay, his master commanded that he be sold, with his wife and children and all that he had, and that payment be made. Here the main emphasis is on both the greatness of the debt owed and the inability of the man to pay it. Thus the king announces that he will exercise his legal right to obtain whatever payment he can by selling all that the man had and then selling the man himself, along with his family, into slavery. The man is clearly in a desperate situation, which leads him to the actions described in the next verse. Here the servant forgets that he will never be able to repay the debt and asks only for patience that he may have more time to repay it. But his master, the king, knows he can never repay, as the next verse shows. NKJ Matthew 18:27 Then the master of that servant was moved with compassion, released him, and forgave him the debt. Notice that the master does more for the servant than he asks. The servant has asked for more time to come up with the money, but the master completely forgives the debt. We are told he does this out of compassion for the man and his plight, which is just another way of saying that he showed mercy or grace toward the man, since he gives the man what he does not deserve. But what will this man's response to the master's forgiveness of the debt be? Will he be transformed by it in any way? Will he share his good fortune with others? Sadly, the answer to each of these questions is, “No,” as the next scene demonstrates. NKJ Matthew 18:28-30 But that servant went out and found one of his fellow servants who owed him a hundred denarii; and he laid hands on him and took him by the throat, saying, “Pay me what you owe!” 29 So his fellow servant fell down at his feet and begged him, saying, “Have patience with me, and I will pay you all.” 30 And he would not, but went and threw him into prison till he should pay the debt. There a few things worth noting here. First, notice that the man's fellow servant asked for patience in the same manner that the man had himself asked for patience. He also fell down at his feet and begged him for patience using the same words that he himself had used before. One would think that these actions would have reminded the man of his own earlier predicament, but it apparently had no affect upon him at all, which leads to the next observation. Second, observe that the man does not show any compassion or mercy toward his fellow servant. In fact, not only does he not show mercy to the man, he doesn't even show the patience he had himself asked for from his master. Instead he demands payment right away and demonstrates his ruthlessness by laying his hands on the man, grabbing him by the throat, and then throwing him into debtor's prison. Third, notice the difference between the debt that the man had owed the king and the debt owed to the man by his fellow servant. The man had owed ten thousand talents, whereas his fellow servant only owes him a hundred denarii. Thus the servant was forgiven far more than he was asked to forgive, which illustrates well the position of every believer who is asked to forgive another. This description pretty much hits the nail right on the head and leads us to the next scene in this parable. NKJ Matthew 18:31-34 So when his fellow servants saw what had been done, they were very grieved, and came and told their master all that had been done. 32 Then his master, after he had called him, said to him, “You wicked servant! I forgave you all that debt because you begged me. 33 Should you not also have had compassion on your fellow servant, just as I had pity on you?” 34 And his master was angry, and delivered him to the torturers until he should pay all that was due to him. Again there are several points that must be considered here. First, observe that the king points out what the man's actions have clearly demonstrated, that he was a “wicked man.” For it is indeed a wicked man who shows no patience or compassion toward another, especially when he himself has been shown such overwhelming compassion! Second, notice that the king is angry with the man because he had learned nothing from the forgiveness that had been offered to him. The king expected the man to have been changed by the experience and to have demonstrated this change in his relationship to others. But the man showed instead that he had no true comprehension of the mercy that had been extended to him. Third, notice that, since the man refused to treat others with the grace with which he had been treated, the king decides to treat the man with the strict justice he had demanded of his fellow servant. In other words, since it was justice the man cared most about, it was justice he would receive! He himself would be cast into debtor's prison, which is indicated here by the assertion that he “delivered him to the torturers until he should pay all that was due to him.” But he could never repay the debt, so the situation in view here is far more severe than the earlier one in which the man would have been sold into slavery! But what lesson(s) should we take away from this parable? Jesus will leave us in no doubt, as we will see in our final point. We find the explanation of the parable in verse 35. NKJ Matthew 18:35 So My heavenly Father also will do to you if each of you, from his heart, does not forgive his brother his trespasses. First, those who are unforgiving of others can expect the same from God. For such a person is wicked and has shown that he has not been changed by an encounter with God's grace. Jesus is not saying that we somehow earn God's forgiveness by being forgiving of others! The point of the parable is the opposite, namely that the debt we owe is one we can never pay. But those of us who have truly understood this and have experienced the forgiveness of God will have been changed by it. And this change will be seen in our relationships with other people. Where this change is not evident, then a true experience of forgiveness is also not evident. Such an understanding of the parable makes sense and fits the context of the rest of Scripture nicely. Second, notice that Jesus expects us to forgive others “from the heart.” This is the issue. We each need to have a forgiving heart, which is the result of a genuine experience of God's grace. Also, if we remember the occasion for telling this parable – Peter's question about how often we must forgive a brother – we can see another application: Whenever we find ourselves asking when we can quit forgiving others, we see a symptom of a much larger problem. We are either forgetting or failing to appreciate just how much we ourselves have been forgiven by God, and this is a grave sin indeed!